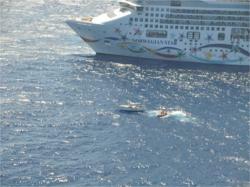 The Amver participating cruise ship, Norwegian Star, rescued 2 sailors from their disabled sailboat 55 miles northwest of Cuba on Saturday, March 3, 2012. The Amver participating cruise ship Norwegian Star launches a small boat to rescue 2 sailors from their disabled sailboat. The Coast Guard, using an Amver surface picture, determined the Norwegian Star was only 30 miles away from the distress location and diverted them to assist. They also launched an Ocean Sentry aircraft to assist in the search.